Combining exceptional technology with a range of thoughtful features, the Plantronics CT14 frees your hands while you carry on clearly audible conversation for up to five hours at a time.A convertible headset provides options for over-the-ear or over-the-head styling; either way, a "firefly" light at the end of the microphone signals that you're in conversation. The dialing unit includes a back-lit LCD screen, 100-station caller ID memory, and 10-number speed dial--all in a compact size that clips easily onto your belt or pocket. An AC adapter is included, along with a lithium ion battery that provides an average of 5.5 hours of talk time or 14 days on standby. Plantronics provides a one-year warranty covering parts and service. Only negative is that you cannot answer or otherwise use the phone while it is charging (must remove the belt unit from the charger). All in all, highly recommended. I have owned a couple hands-free phones in recent years and find this to be a big step forward in sound quality, comfort, and size. The boom microphone is excellent. It doesn't reach around in front of your mouth the way old-fashioned headsets did, which is an advantage. A red LED at the end flashes to let people know you are on the phone. Drop the phone into the base unit and it charges automatically, giving you about 5 hours of talk time. A stalk on the base unit swivels up so you can hang the headset up when its not in use. Comfort is so good you can forget you have it on (I wore it out to my car the other day. Doh!). The handset has a belt clip and there is a shirt clip to keep the cord out of your way. You can switch the ear piece and mic from one ear to the other in about three seconds. Likewise, you can pick up the headset almost as quickly as you could a regular phone. Range is good. I pace around my office and don't find the signal degrades, although walls, partitions and doors will obviously shorten range. If you need more range than this offers, you probably need a cell phone. Build quality and metrials are both excellent. It takes normal wear and tear and has been dropped several times with no ill effects. Design is modern and attractive. The only shortcoming worth noting is ergonomic -- I had to dock it one star because the buttons are needlessly small (think TV remote circa 1990), though they are clearly marked and easily readable. While performance of this phone is great - fantastic, in fact, I think the functionality of the phone is a bit clumsy for women. The range is great. Audio is crystal clear. No interrupts on our wireless-g network, save one small glitch with the laptop, resolved by changing channels. The belt clip is for belts, not slacks or skirts. Women don't always wear belts. It needs more tension or a tighter grip to be able to hold on to the thinner materials women wear. I tried using the clip to hook it to a long key lanyard, worn around the neck, but it was too heavy/clunky to be worn that way comfortably. Problem 2 - headset or over the ear? Again, a "woman" issue - small ears prevent me from comfortably using the over the ear ear/mic. Using the headset is great with the exception of a little too much tension on the ear causing a sore spot, earpiece cover isn't soft enough to accommodate even small earrings (conforming foam would have been better). Recommendations to the manufacturer - it would be *great* if, after you fix the tension issues w/ the beltclip, you could fix it so the belt clip would mount in either direction. What I mean is wearing the unit upside down would allow you to read/see display & buttons when looking down at it. I purchased this phone with high hopes of using it as my primary home office phone. The phone directly interferes around 50% of the time with my 802.11.B wireless network. Since the phone channel can not be fixed, the Plantronics CT12 will randomly knock me completely off the network. No amount of calls to Plantronics or fiddling with my wireless channels improves this problem. Thier answer is that the channels are choosen by the phone and there's nothing they can do. I've returned the phone for a refund. The other problem is that the phone can not be used while it's in the charging base, so you'll need to have another office phone for when the battery runs low. If it weren't for these two major issues, it's a nice phone with clear sound and the little red light on the mic boom is cute. I've had mine for a week or two now. It's one of the best things I've ever bought. It sounds clear and no one has any trouble hearing me. I haven't had an opportunity to test its range yet. I do have a few qualms with it. Really they are more like suggestions for the next version of this headset. They need to come up with a better way of attaching the headset cord to the control box. I first tried just plugging in the cord straight into the control box like the diagram shows. Unfortunately the first time I accidentally knocked the unit off my belt and the control box reached the end of the slack in the cord the headset plug popped out of the jack in the control box. After that I started looping the slack through under the belt clip. That way the connector is pulled down into the jack rather than up and out of the jack. That helped. I don't knock if off very often. There's probably a slick way of engineering better cable management. I just can't think of if at the moment. I also wish I could set the microphone sensitivity. The mic picks up my breathing from time to time. I've tried placing the mic below my chin and even up as high as my nose. It's not catching actual wind. Instead it's actually picking up the sound of my breathing. Being able to adjust the sensitivity would be nice. The only suggestion I can think of is for the engineers to make it easier to blindly find more of the important buttons. Only the "5" button has a raised dot in the button surface to tell the user where his finger is. It would be nice if the Talk and End buttons also had something unique on each to guide the ever blind finger. Mute is also likely to be used blindly. It wouldn't hurt to give that button a texture as well. 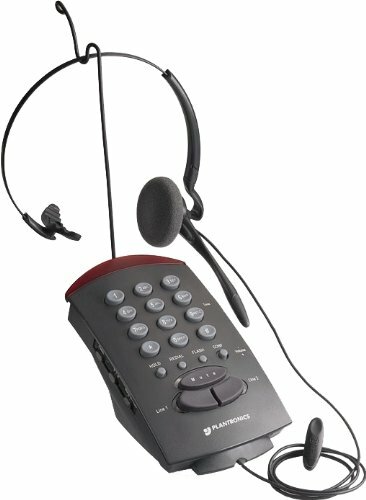 The S12 telephone headset system from Plantronics provides a hands-free method of communication which works with all single and multi-line phones. With convenient over-the-ear and over-the-head configurations, you can adjust the headset for maximum comfort, while volume and mute controls provide a way to adjust headset audio levels for maximum convenience. The noise-canceling microphone and Call Clarity technology deliver clear, easily-intelligible sound, and an in-use indicator light provides a visual phone status indicator. With a 5.75-by-9.0-inch footprint, the S12 fits easily onto available desktop space, while a headset stand provides a convenient resting place for the headset. The S12 weighs just 2 pounds and comes backed by a one-year limited warranty. Ideal for busy professionals of all types, the Plantronics CS10 Cordless Telephone System elevates your multitasking abilities to a new level. Its 900 MHz reception results in clear, intelligible sound quality up to 150 feet from the base, while the convertible over-the-ear and over-the-head configurations provide both comfort and convenience. Plus, hands-free operation helps to reduce neck and back strain, and the CS10 has been endorsed by the American Physical Therapy Association. The system installs easily and is compatible with both single and multi-line phones, making it ideal for reception work, conference calls, or even to use at home. A paging feature saves you from spending hours looking for your phone. The rechargeable battery handles around 6 hours of talk time and 8 hours of standby. Other features include a recharge light indicating when battery power is running low, as well as lights to indicate phone status. Luckily, the headset is functional even when recharging in its cradle, so you can still make important calls anytime. You can adjust ringer and handset volumes via simple controls, and you can change reception channels in order to find the clearest connection. About a year ago 5 sales, 2 purchasing, and 3 traffic staff plus IT/accounting switched to these units. Installation is simple, batteries have held up good. We live on the phone. It's freed us from our desks without missing calls. Phone time is much more productive. We pull and send the documents to our customers while they are still on the phone. We can even "walk" them through departments, ask questions, getting answers right then and there. Remember to use the mute button if you do not want the caller to hear what other people are saying to you! I took a customer that called in through the warehouse describing the package labels to him over the phone. I take the dog for a walk and still get my calls. Reception is poor 80 feet from the base unit in a concrete building. I can't wait for the next generation -2,400 mhz systems, it will enable us to take a call anywhere in the facility. I have had this headset for over 3 months now and I am extremely pleased with it. The clarity is a perfect 10 -- people that I am talking to cannot tell whether I am on the regular phone or the CS10. I have used the original Hello Direct cordless headset for a few years. People often complained that they couldn't hear me well and asked me to speak louder. I often ended up switching to the regular phone. So I retired that headset and bought a GN Netcom 9020D. The clarity was as good as the CS10, but I would hear an echo of myself. I called Hello Direct and bought another 4-line telephone that they claimed was compatible, but the echo remained. So I finally bought the CS10. I almost did not because of some of the negative reviews here on Amazon.com, especially in regards to Plantronics' service should something go wrong, but pain was starting to creap back into my neck and I had little choice but to at least try. I have been very pleased with this headset and I highly recommend it. Setup was far more straightforward than with the earlier headsets that I owned: I didn't have to change any of the default switch settings. There is, of course, room for improvement. 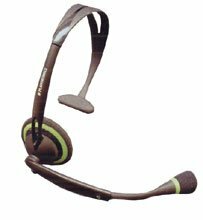 One thing that I always liked about the Hello Direct and the GN Netcom headsets was that the transmitter was mounted on the headset itself. I wish Plantronics would revise the CS10 to make the headset an all-in-one unit instead of having the transmitter as a separate unit linked with a cord. Or at least include a holder or holster where one can tuck away the transmitter (this should not be a separate purchase, IMHO). Handset-less is the way to go! The CS10 is my first and only experience with a headset of any kind. Hadn't even tried one out before. I picked this brand as they seem to have a lot of name recognition. I picked this particular model (cordless remote) so I didn't have to be "tethered" to the phone. The instructions to get set up and started were very easy to follow. The quality of the product is excellent. It has been very liberating not to have to pick up the phone handset every time the phone rings and also not to be cradling the handset between my ear and shoulder. I did some research on prices and Amazon's price was the lowest I could find....combine that with their free shipping on orders over [money] it was an excellent deal. If you buy this model you really need to buy the HL10 handset lifter. My only regret is that Amazon didn't have any in stock and I had to purchase from another vendor. In a business setting the CS10 is an excellent choice! This is an awesome product, saved my neck. It is very easy to use and worth every dime. A bit of advice...Get the handset lifter attachment, very cool!! While convenient and a nice, lightweight unit, the voice pickup is very poor, regardless of how you adjust the set.This is not only with the set I have used, but with others I have talked to - you can tell if the person on the other end of the phone is using one of these units because they are so faint.I've gotten so I just ask if they're using a Plantronics CS50 when they are faint and the answer is invariably "yes".Also, if you are in a building with a lot of exposed metal (window/door frames, high cubicles with lots of metal), the range deteriorates significantly. 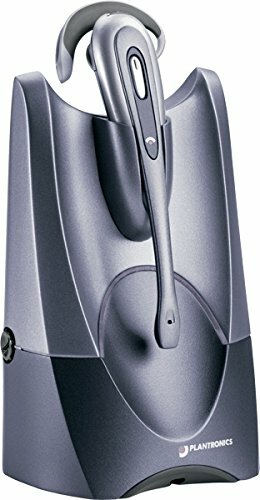 The range is great , so if you skype and dont want to be tied to your pc then plug this bad boy in and your free to walk all over the house , same goes for teamspeak for the gamers out there. 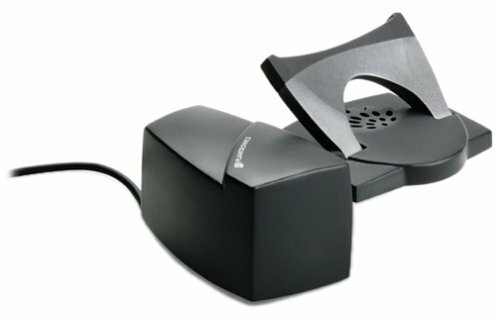 Type, fix dinner, or just relax as you talk on the phone with the Plantronics CT10 900 MHz cordless headset. 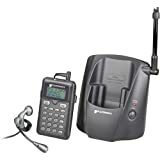 This 900 MHz cordless phone consists of a base unit and lightweight headset with a single-ear speaker. The headset's noise-canceling microphone picks up your voice clearly while filtering out background noise. Range in most indoor environments is not a problem with the Plantronics CT10. This cordless phone, essentially a low-powered FM radio transmitter/receiver, uses high frequencies with short wavelengths so radio waves encounter less interference. 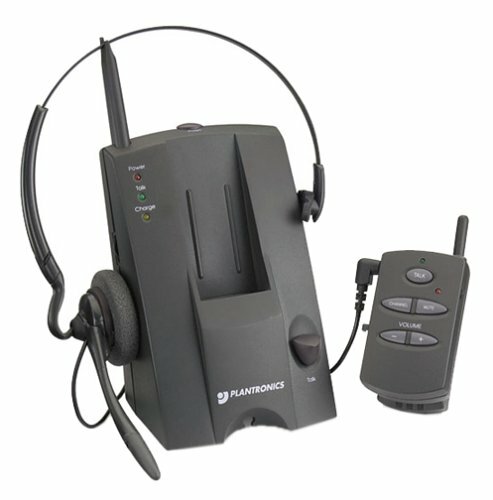 A 900 MHz cordless phone like the Plantronics CT10 typically has a range of up to 150 feet indoors. The headset will beep three times if you wander out of range of the base. Operate the headset using the handy remote dialing unit, which plugs into the headset via a jack. The remote unit is charged and stored in thephone's base, which also features a stand for storing the headset, clearing up desk space. Don't worry about losing track of the remote unit--a page button on the base sounds a beep that helps you locate it. This phone uses a single line and has analog operation. Additional features include 10-number memory dialing that allows you to dial frequently used numbers with the touch of a button. Each phone number stored can be up to 16 digits. A mute button shuts off the microphone so that you can talk without a caller hearing you--a soft beep tells you when the mute is in use. Redial allows you to dial the last number you called with one touch of a button. The flash key supports call waiting and other features. The volume control lets you adjust the sound level of the headset. The Plantronics CT10 is powered by a 9-volt DC rechargeable battery with six hours of talk time and 80 hours of standby. The remote signals you with a light when it's time to park it in the base for recharging. A cordless headset like the Plantronics CT10 is ideal for busy parents, homemakers, and home-office workers. Save time and sore muscles with this affordable and feature-packed headset. Two weeks ago, I purchased the CT-10 after reading a few online reviews. My concerns about the volume proved to be valid. My hearing is not perfect, but my girlfriend had trouble with the level as well. I have been using a Plantronics Binaural Supra headset at work for many years, and have been very happy with it, so I was hopeful that the CT-10 would meet my needs. Bottom line: It doesn't get loud enough. With the volume cranked, I still could not hear the other party well in 50% of my calls. I even ordered the adapter to see if there was any improvement with the use of my Supra headset. It didn't help any. I'm disappointed, as I like many of the features of the unit. The base and phone are well designed and I like the fact that the headset is detachable, but none of it is enough if you can't hear your call. I was often asking a party to speak up and to repeat himself. I was told by tech support at Plantronics that the CA-10, their cordless headset amplifier that hooks up to a regular phone, would have better volume. It looks almost identical, but it is simply an amplifier, so I suppose this could be true. I'm not willing however, to shell out more money for something that does less. If you wanted to answer phones remotely with the CA-10, you would need the handset-lifting device, and you can't dial remotely with it. That may eventually be a good solution for me, but for now I have exchanged my Plantronics CT-10 for a GE cordless headset phone with caller ID. It is larger, and I am kind of amused by the spring-loaded contacts that want to tip the phone out of the charging base, but my calls are "loud and clear." 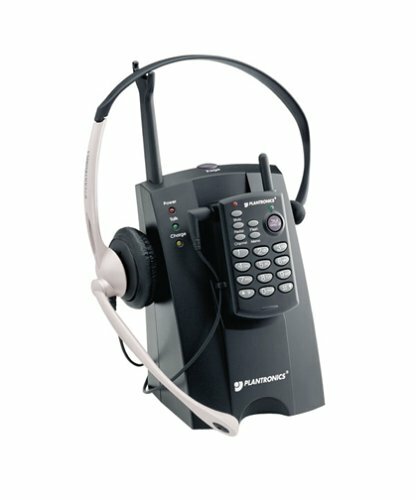 The headset is hardwired into the phone which is a negative if it needs to be repaired, and it is more than twice the size of the CT-10, but in my opinion, it does the job better. Granted, I have only been using the GE unit for a few days, so I may discover other issues, but for now it is the solution at $30 less. That reminds me: I also had a problem with static on my CT-10. It was associated with the headset jack. Just touching the jack lightly while on the phone would cause an annoying static that both parties could hear. I assumed that my unit was defective, but didn't want to try another CT-10 anyway. The GE model is: 26970GE2-A. Good luck. 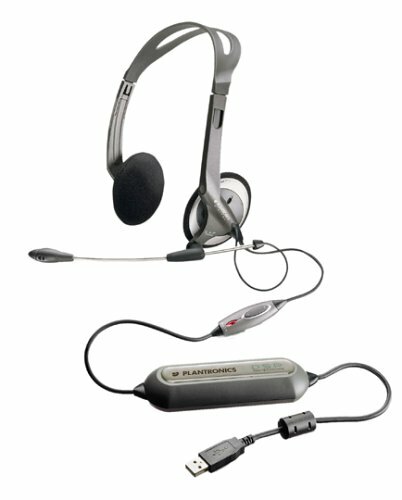 Plantronics usually makes quality products. This is not one of them. The case is sturdy and headset is ok. The battery is built into the belt clip which is mounted upside down for some who knows why reason? Then I tried it... audio came howling back into the earpiece like an echo, similar to the original cordless phones 20 years ago. Totally unacceptable!! Back it went and replaced with the new Plantronics CT12 and its GREAT! Totally different, regular type lithium battery and sounds and talks great! Well worth the little $ difference. The other reviewers are right on. The phone is excellent and I've come to trust Plantronics equipment for home and office. The numbers are fine even if on the small side. My major complaint is trying to keep it on the belt or some place where it won't fall off and hit the ground! The battery replacement I purchased does not fit snuggly on the unit and slips off easily. Reception is fine and I agree with the volume comments of other listeners-adequate, but a touch on the low side. I did have a problem with the first unit and it was replaced with out difficulties. I've had it over 2 years and would gladly give another as a gift although the caller ID feature on the CT12 is nice. I've heard the numbers on the CT12 are even more difficult to use, but for the added convenience of caller ID and 2.4ghz it may be worth the trouble. The BEEP, BEEP is annoying! But like anything else, accept it and it seems more tolerable. Nice phone, EXCEPT -- it beeps when on mute. How are you supposed to stay on conference calls all day with that in your ear??? No way, Jose. Still looking for a better option. The CS10 cordless telephone headset from Plantronics is designed to add truly hands-free communication to your existing desktop telephone system. Perfect for multi-tasking in the home or office, the CS10 provides mobility and ease-of-use. 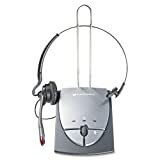 You can adjust the headset to your liking with convenient over-the-ear and over-the-head configurations, while the remote unit clips to your belt and allows you to answer incoming calls and end conversations without having to return to the telephone base. A clothing clip for the headset is provided to help avoid tangled cords, while a pager/locator helps you quickly locate a misplaced remote unit. The CS10 utilizes the 900 MHz signal and has a range of up to 150 feet from the base unit, while transmit and receive controls let you adjust volume levels to your liking. It is also easy to set up. Simply connect the base to an existing telephone system with the included 2.5mm connector, charge the remote unit, and your ready to go. The NiCad battery provides up to 6 hours of talk time and up to 80 hours on standby, and a low-battery indicator lets you know when to return the remote unit to its base for recharging. The CS10 base fits easily next to your existing telephone system with its 3.75-by-4.5-inch footprint, and the remote unit weighs a mere 4 ounces. The system also comes backed with a one-year limited warranty. If you are on the phone for hours a day, the benefits of a headset over a handset become clear--especially if it is as light and comfortable as the Plantronics T10 model. 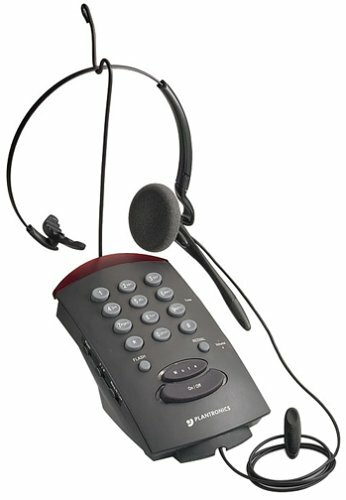 This phone uses a corded headset, which decreases mobility somewhat, but it is unusual in that it comes with every accessory you'll need to use the headset in an over-the-head or over-the-ear configuration. Installing this phone is child's play. A standard telephone cord (included) connects the small base unit to a wall jack, and the headset cord connects to the front of the unit. No power cord is necessary. 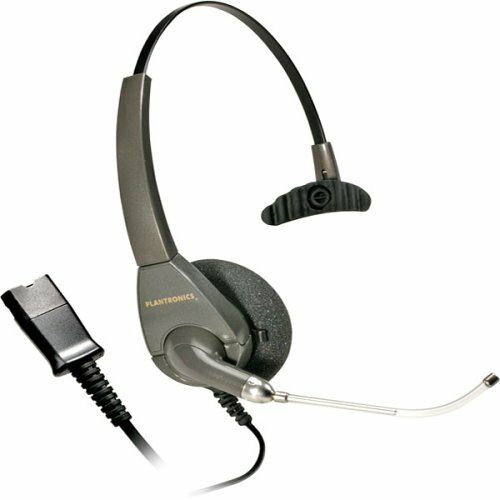 Plantronics used a standard telephone jack interface for the headset but wisely used light headphone cable instead of bulky telephone cord on the unit. This helps keep the headset's already low weight to a minimum. They've also thoughtfully included a small alligator clip on the headset cord so you can clip it to a shirt pocket and keep the cord from brushing your face as you move. As mentioned, the headset microphone and speaker unit can be attached to an ear hook or a headband. The headband is very light and highly adjustable, but we preferred using the ear hooks. Plantronics packages three different sizes of hooks with the device, so there's bound to be one that fits. The hooks sit on your ear instead of using a clamping mechanism, and the entire assembly is so light and unobtrusive that we were able to forget it was there after a few minutes. The microphone is the type that extends to your cheek instead of in front of your lips, so you don't have to deal with it bumping against your lips when you talk. For all these reasons, we were able to wear the headset all day without it getting in the way or making us look like extras from a bad sci-fi movie. I use this phone at work. I have been looking for a replacement. The features are nice and the headset holder is nice to have, but it has one terrible flaw - the clarity is non-existent! It sounds like the person on the other end is talking through a pillow. Turning up the volume doesn't help, either, it only amplifies the fuzz. We have another, older Plantronics phone that has much better sound quality, so maybe we just got a faulty one. I wouldn't risk it, though. I needed a phone for a home office. This phone was recommended and I bought it through an Amazon affiliated merchant. It is my 1st handsfree phone and I love the convenience of it! No more neck aches. Sound quality is as good or better than my cordless phone and no interference so far from any of the other equipment in the office. Small size base, comfortable headset. I would change 2 things - the MUTE button is right above the ON/OFF button and could cause an embarrassing hangup. The other is a longer headset cord. It appears to be about three feet long. Otherwise very nice! This is the second model of this phone I have purchased - I'm a repeat buyer because the first one worked out so well. Great, clear sound quality, and a comfortable headset. I prefer a corded phone to cordless for the security factor, and because in a power outage a cordless phone is not operable. If you want a corded phone with a headset, this is the one! I purchased this phone for use in a home office and discovered immediately that it picked up a local radio station at a very audible level. I visited the Plantronics website and discovered that were well aware of this problem because it was listed in the FAQ on how to address the situation which they claimed was cause by living too close to radio station towers (we don't live near any radio towers). It went on to suggest ordering a filter to be installed between the phone and the headset control unit, but since this model has the head set control and phone fully integrated, I was doubtful of the solution. The alternative was to try several different locations and I finally discovered that if the phone was placed in my closet, the intereference dissappeared. I finally threw it away because of this ridiculous issue. Apart from this, it's a great phone, but this fatal flaw made it useless to me though I'm sure some users may never encounter this problem. 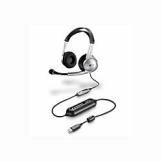 The Plantronics DuoPro H181N behind-the-neck headset is perfect for anyone working in a call center or customer service capacity. 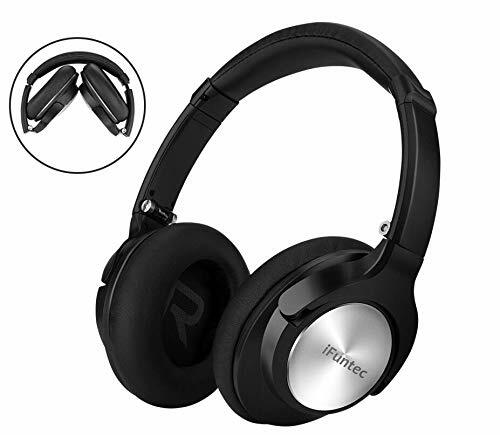 It can be worn on either ear and features a unique anti-twist, noise-canceling boom-style microphone, making it ideal for loud environments. The headset offers a sleek modern-looking design and comes with a 10-foot coiled cord with adjustable clothing clip to keep it in place, and a quick disconnect feature to let you walk away from your phone while still wearing your headset. It weights just 1.1 ounces, practically eliminating fatigue, and won't mess up your hair. The H181N requires a Plantronics amplifier (sold separately) for connection to your phone. I've been using a tri-star headset at home for several years. I like it so much that now I'm buying a second one to use at work. If you don't like the idea of having a bulky headset or a band that goes across the top of your head, then this headset is perfect for you. It fits right over your ear and is very comfortable, even for those long conference calls. Voice pickup and sound quality is top-notch. You will need an amplifier of some sort. I've been able to get mine to work with a Cisco IP phone and a Polycom phone with simple adapter cables, so check your phone first to see if it has headset support built in. The Plantronics Tristar headset is the best telephone headset I've found. The Plantronics T20 is a two-line telephone with a convertible headset for hands-free conversations. It features three-way conference calling and flash, redial, and hold functions to enhance your home or office productivity. A red light on the phone's base indicates whether an incoming call should be answered on line one or line two. If you want to place a caller on hold, press the hold button; the light flashes until you press the hold button or the appropriate line button again. By placing one caller on hold, then dialing a second party and connecting the two lines with the conference button, you can have a three-way conference call. The Plantronics T20 comes with a convertible headset that is light and comfortable to wear for long periods of time. The headset features a sturdy headband, padded flexible earpiece and headpiece, and a fully adjustable microphone. The microphone can be worn with the headband or with ear hanging hooks on either ear. The sound quality of the earpiece and microphone is very clear. A tone control lets you adjust the tonal quality of your incoming calls. This phone works well for what I need -- but I've gone through two headsets in two years! The first one just quit working -- the second was destroyed when my son stepped on the cord and it broke off at the jack. So be sure to have a warranty or a replacement plan ... and of course, it's the headset, not the base, that's the expensive part. Since this product is still being sold and preceding reviews were some time ago, I'll share my recent experience with the product. It's stylish and solid. The volume and tone controls are accessible and effective. Received audio (ear speaker) is clear and rich. Transmit audio (microphone)is adequate, but could use a gain control. Disappointments: Line and mute controls are very close together, occasionally leading me to disconnect a line when I reach to mute it. No memory functions other than 'Redial', which doesn't seem to work on the second line. GLARING INADEQUACY: The BLARING touch tones generated by dialing and navigating through interactive phone systems are way too loud, even at the lowest volume settings. Bad idea, bad design, bad Plantronics. Bad, bad, bad. you can have it on sale. And can you ship to Taiwan? I LOVE the style of this phone! I love how the top lights up BRIGHT RED when I'm on the phone. I love how the mute lights up when enabled. I love the tone and volume controls and the fact that it handles two lines beautifully--each lighting up green when active, red when ringing. Even the headset is stylish AND convertible (over-the-ear or over-the-head)! If only I loved the QUALITY!! :-( The sound is HORRIBLE. When dialing, the tones are deafening--to the point of pain. Seriously. There is also an irritating noise. It's sounds like an auto-gain control (maybe the noise-cancellation) that induces a hiss ONLY when someone is speaking. If there is silence on the line, it is silent. When someone speaks (me or the caller) the hiss joins in. Fortunately, the callers can't hear it. Also, people say they can't hear me very well. They say it sounds very thin compared to my cordless phone. I'm really sad that this beautifully designed phone fails to perform. If I can get over the BLARING TONES and the ANNOYING HISS and the POOR SOUND QUALITY, I'll keep it. Otherwise, I'm taking it back. If this product were only as pleasing to the ear as it is to the eye! But it's not. After more than a quarter century of engineering headsets/amplifiers one would think that Plantronics would get it right. Wrong!! These headphones were up and running in minutes with no messing. These headphones come with a usefull collection of bundled software including PerSono Audio Centre, L&H Voice Express 4, Roger Wilco, HearMe and Net2phone. These headphones are great at doing what they are built for i.e. chatting whilst playing games, using voice recognition programs for hours on end in total comfort. Although the sound is of an excellent quality under low to medium volumes they start to distort a lot if the sound is cranked up. If you are looking for a pair of headphones to blast out mp3 till your ears bleed then look elsewhere (sennheisser.com) If your after a set of headphones that let you play games and chat without a loss of sound quality or that enable you to dictate for hours on end without realsing that you have a pair of headphones on your head then these headphones are for you. Con's: A little pricey, L&H Voice Express wouldn't work on XP Pro without downloading SAPI 4 from M$. I had to figure this out for myself as L&S don't seem to support VE4 anymore. This is a great unit. Digital USB headphones offer a step up in performance and flexibility from ordinary headphones. There is precise capability to adjust volume, treble, base, etc. The control software also comes with preset countours for voice and for music. The sound quality is awesome. I highly recommend these headphones.